All washes are done in slide-staining boxes or Coplin jars. 1. Immerse the slides in 2X SSC at 65°C for 30 min. Wash at room temperature in the following: 2X SSC for 2 min, two washes of 70% ethanol for 5 min, and two washes of 95% ethanol for 5 min. Air-dry. 2. For each slide, dilute 0.3 |L RNAse (Roche DNAse free, 10 mg/mL) in 40 |L of 2X SSC. Pipet onto the sample on each slide and cover with a 22 x 22-mm2 cover slip. Incubate in a humid chamber at 37°C for 1 h. Wash at room temperature in the following: 2X SSC for 2 min (cover slips will float off here), two washes of 70% ethanol for 5 min, and two washes of 95% ethanol for 5 min. Air-dry. 3. Prepare 200 mL of 0.1 M TEA from 1 M stock in a 500-mL flask. Quickly add 320 |L of acetic anhydride to the TEA, swirl, and pour on top of the slides in a rack in a staining box. Incubate at room temperature for 10 min. Wash at room temperature as follows: two washes of 2X SSC for 5 min, two washes of 70% ethanol for 5 min, and two washes of 95% ethanol for 5 min. Air-dry. Slides can be prepared to this point and stored at 4°C for 1 d.
4. Denature the chromosomes in NaOH as follows. It is important that the denatur-ation time be precisely 3 min and that you hybridize the slides immediately after drying. Wash at room temperature in the following: 70 mM NaOH (freshly prepared) for 3 min, 2X SSC for 5 min, two washes of 70% ethanol for 5 min, and two washes of 95% ethanol for 5 min. Air-dry. 5. Denature the probe(s) in a 0.5-mL microfuge tube at 95°C for 3 min and then quick-cool on ice. For each slide, you should have a probe volume of 2 ||L. If you are using single-stranded oligonucleotide probes, denaturation is not necessary. Use 5-30 ng of each probe per slide. 6. Add 10 |L of hybridization mix for each slide to the probes. Mix by pipetting. 7. Pipet 12 |L of hyb-probe mix onto the area of the slide containing the tissue. This is often still visible as a slight clouding. Cover with a 22 x 22-mm2 cover slip, with as few bubbles as possible. Seal the edges with rubber cement. Incubate in a humid box for 5 h to overnight (see Note 3). Remember to keep the slides in the dark if you have direct labeled probes. 8. Prewarm the formamide mix to the desired temperature (25-37°C). 9. Remove the rubber cement and float off the cover slips in 2X SSC at room temperature. 10. Incubate the slides in two washes of 2X SSC, 50% formamide at 25-37°C for 30 min. 11. Wash at room temperature: in PBS for 1 min, in two washes of PBS, 5 min each, in PBS with 0.1% Triton-X 100 for 5 min, and in PBS for 5 min. 12. It is very important not to let the slides dry at all during this step and the next. Do each slide one at a time. Remove a slide from PBS. Aspirate off excess PBS, and on each slide, pipet 100 |L of PBS with 1% BSA. Cover with 40 x 22-mm2 cover slip. Incubate at room temperature in a humid box for 30 min. 13. Turn down the lights. Dilute streptavidin-Cy5 1:600, anti-DIG-rhodamine 1:300 and/or anti-BrdU-FITC in PBS with 1% BSA. 14. Float off the cover slips in PBS. Remove the slide from PBS. Aspirate off excess PBS and pipet on 100 ||L of the detection mix. Cover with a 40 x 22-mm2 cover slip and incubate at room temperature for 1 h in a dark humid box. Wash at room temperature in the following: two washes of PBS, 5 min each, PBS with 0.1% Triton-X 100 for 5 min, and PBS for 5 min. 15. Stain in DAPI. Remove the slides from the final PBS wash and immediately treat in the following washes: dH2O for 10 s, 0.4 |g/mL DAPI in dH2O for 20 s, dH2O for 10 s. Air-dry. Shield from excess light by putting a box over the slides while they are drying. 16. Immediately after air-drying, mount in 10 |L of Vectashield (or other glycerol-based mountant with antifade) under a 22 x 22-mm2 cover slip. Seal the edges with nail polish. Store slides at 4°C (see Note 4). 17. Image using fluorescence microscopy (see Note 5). 1. At room temperature in slide-staining boxes, treat the slides in the following washes: PBS-TX for 5 min, 2 M HCl in PBS-TX for 30 min, PBS-TX for 10 min, and three washes in PBS for 5 min each. 2. It is very important not to let the slides dry at all during this step and the next. Do each slide one at a time. Aspirate off excess PBS, and onto each slide, pipet 100 |L of PBS with 1% BSA. Cover with a 40 x 22-mm2 cover slip. 3. Incubate at room temperature in a humid box for 1 h. Float off the cover slips in PBS. 4. Aspirate off excess PBS. On each slide, pipet 100 |L of anti-BrdU FITC in PBS with 1% BSA. Cover with a 40 x 22-mm2 cover slip. Incubate at room temperature in the dark in humid box for 2 h.
5. Treat the slides in the following washes: PBS for 5 min, PBS with 0.3% Triton-X for 5 min, and PBS for 5 min. 6. Stain in DAPI. Remove the slides from the final PBS wash and immediately treat the slides in the following washes: dH2O for 10 s, 0.4 |g/mL DAPI in dH2O for 20 s, dH2O for 10 s. Air-dry. Shield from excess light by putting a box over the slides while they are drying. 7. Mount in 10 |L of Vectashield immediately after air-drying. Seal the edges with nail polish. Store slides at 4°C in the dark. 1. BrdU is toxic to larvae at too high a concentration or if they are exposed to it for too long. We have used concentrations from 0.4 to 2 mg/mL. When concentrations less than 0.4 mg/mL were used, incorporation could not be easily detected after 2 h of feeding. When larvae were fed 1 mg/mL BrdU from 95 to 105 h AED until pupation, 95% pupated and 12% emerged. When larvae were pulse-fed as described in this procedure (using 1 mg/mL BrdU), all of the larvae emerged and were fertile. Further information concerning effects of BrdU on various parameters can be found in ref. 6. A detailed description of the time-course of incorporation in CNS nuclei can also be found there. 2. It is important that the slides, tools, and working surface be relatively dust-free and clean. The dissecting scope and working surface should be wiped down with a damp cloth prior to use. Care should be taken to keep slides and cover slips covered. 3. Temperature of hybridization and/or formamide concentration in both the hybridization mix and wash may need to be changed depending on the probe. For instance, the (AATAT)n (45 bp) oligo probe only works at 25°C in 40% formamide, whereas (AAGAG)n works fine at 37°C, 50% formamide. In general, we hybridize genomic probes at 35°C and 50% formamide. It is very important that the temperature of the incubation not spike above the desired hybridization temperature and that the formamide wash is never above the hybridization temperature. Because of this, hybridizations and posthybridization formamide washes are done in high-precision water baths. Slides are placed in a humid chamber and weighted down in a water bath. The water level is just below the lid and the bath is kept covered. 4. Slides will easily last at least 2 wk at 4°C without loss of signal or degradation. After that, the direct labeled probes seem to begin to disperse. However, in my experience, the indirect labeled signals last at least a few months, as does the DAPI and BrdU-FITC labeling. 5. Our lab uses a Deltavision system from Applied Precision, Inc. (www.api.com/ products/bio/deltavision), which records epifluorescence images on a chargecoupled device (CCD) camera. This is a three-dimensional deconvolution microscope that allows images to be taken at very high resolution and is a commercial version of the technology developed by the Sedat and Agard group (7). Such a complicated setup is not necessary for this procedure, but there are certain aspects that are very helpful. First, unlike a confocal microscope, the number of different fluors that can be imaged is limited only by the availability of the colors and the filter sets, not by the need to include different lasers. The setup described can collect images excited at four different wavelengths from ultraviolet to far red. This is especially important if you wish to examine the relative positions of two different chromosomal regions during the S-phase. Second, the cooled CCD camera along with deconvolution software allows the detection of very weak signal with minimal background noise from the camera. 2. Foe, V. E., Odell, G. M., and Edgar, B. A. (1993) Mitosis and morphogenesis in the Drosophila embryo: point and counterpoint, in The Development of Droso-phila melanogaster (Bate, M. and Martinez Arias, A., eds. ), Cold Spring Harbor Laboratory Press, Plainview, NY, Vol. 1, pp. 149-300. 3. Ashburner, M. (1989) Drosophila: A Laboratory Manual, Cold Spring Harbor Laboratory Press, Cold Spring Harbor, NY. 4. Gatti, M., Bonaccorsi, S., and Pimpinelli, S. (1994) Looking at Drosophila mitotic chromosomes. Methods Cell Biol. 44, 371-391. 5. Marshall, W. F., Dernburg, A. F., Harmon, B., Agard, D. A., and Sedat, J. W. (1996) Specific interactions of chromatin with the nuclear envelope: positional determination within the nucleus in Drosophila melanogaster. Mol. Biol. Cell 7, 825-842. 6. 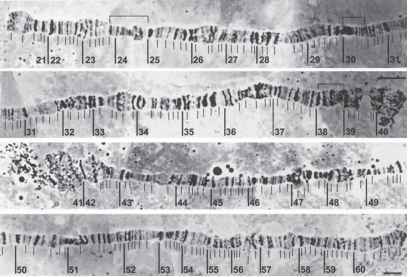 Csink, A. K. and Henikoff, S. (1998) Large-scale chromosomal movements during interphase progression in Drosophila. J. Cell Biol. 143, 13-22. 7. Agard, D. A., Hiraoka, Y., Shaw, P., and Sedat, J. W. (1989) Fluorescence microscopy in three dimensions. Methods Cell Biol. 30, 353-377.